Yes, we're lacking in wider context. And in "the reason" for wanting to go long. But whatever that reason is, it's clear our intent was to fight a strong downtrend. And the fact is that we don't get 100% winners. A good percentage of our trades are wrong. So let's hold for a second and watch the immediate, short-term movement. Despite the fact that we intended to fade the market, circumstances have instead led to us being aligned with the momentum. Perhaps this will allow us to work a breakeven exit. Or even achieve a profit. Is there an immediate threat? I'd say almost certainly, yes! You've found yourself fading some strong bullish momentum. Your position is very likely to get run over, making the current poor situation even worse. It's going to feel a WHOLE LOT MORE uncomfortable than the downtrend example. And the decision to scratch will likely come VERY quickly. In both examples above, how long did it take you to assess the situation as to whether or not it provides an immediate threat? You have the skill to recognise an immediate threat! And you should have sufficient time.If you're trading such that a second or two of extra loss can cause critical damage to your account, then you're trading too large a size. 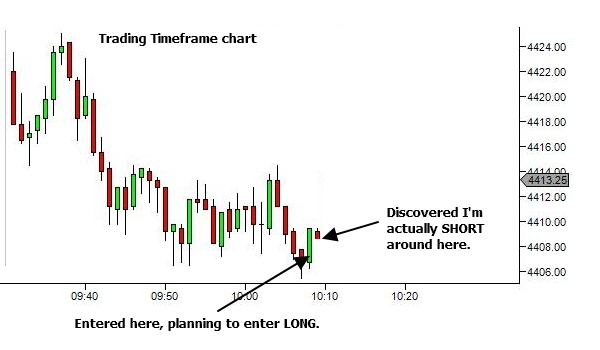 If you find yourself with an order entry error, quickly examine the Trading Timeframe chart. Are you positioned against strong momentum? Does it immediately invoke feelings of fear or discomfort? If so, scratch the position. If not.. just pause and assess the situation. There might be some hope of rescuing the situation. Or even of achieving a profit. Not all examples are as obvious as the two provided above. They're extreme cases with the underlying momentum moving strongly in one direction. 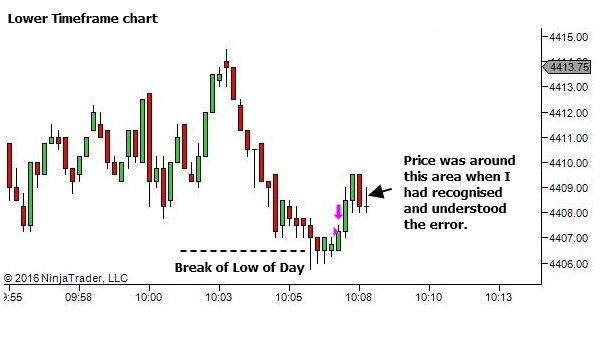 Let's look at the Trading Timeframe chart from the trade sequence which led to the earlier social media posts, intra-candle, at around the time of discovering the error. Does this immediately invoke feelings of fear or discomfort? Apart from frustration and anger at the entry error… not really. While the downtrend is not as strong as in the earlier example, my trade idea was still fading the overall momentum of the market. And I now inadvertently find myself aligned with that momentum. In the immediate short-term, there's no need to panic. So I didn't scratch. I reassessed the situation and attempted to work a better exit. 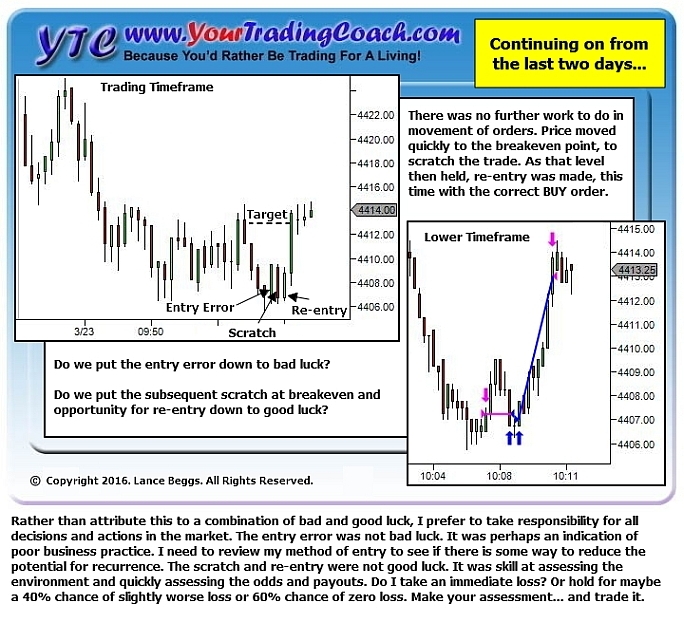 Let's see the lower timeframe at the time of recognition of the error. Where is the point at which I am wrong and have to take the loss? How far can I reasonably expect price to move in my favour? Which direction is more likely in the immediate short-term (next price swing or two on the LTF)? You might note that the original social media posts mentioned a 60% chance of movement lower versus 40% chance of movement higher. It's not actually this scientific. It's just a quick assessment of "which feels more likely" given the ease with which price moved in recent swings. I assign a probability to give an approximate degree of likelihood. Now that I've decided to work the exit, it does not mean I passively hold until either the new stop or target are hit. The odds are constantly reassessed and the position is actively managed. As soon as I suspect the odds of favourable movement are less than even, I'll either scratch or very aggressively tighten the stop. I'm WORKING an exit as favourable as possible, not sitting back and hoping for a bit of luck. You've just discovered an order entry error that has you positioned in the wrong direction. Is this cause for panic and immediate exit? How long will it take you to assess whether or not there is an actual imminent threat to your position? Perhaps only a second or two. If you're trading such that a second or two of extra loss can cause critical damage to your account, then you're trading too large a size. Pause… assess the situation.. and trade what fate has provided you with. Are you at or beyond your daily loss limit? Or is your mindset a mess? 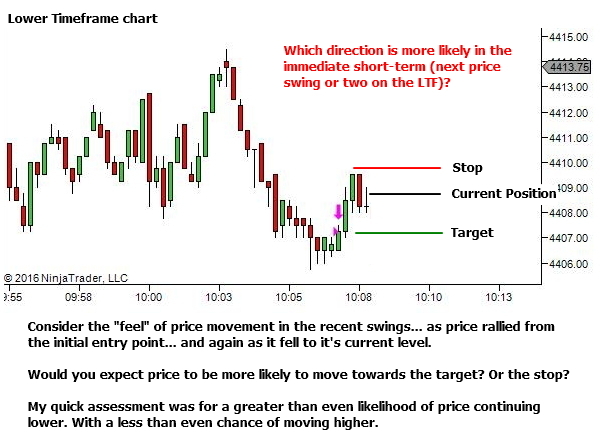 Look to the trading timeframe chart and make a quick assessment. Does the position suggest an immediate threat of quick movement to even worse price levels? 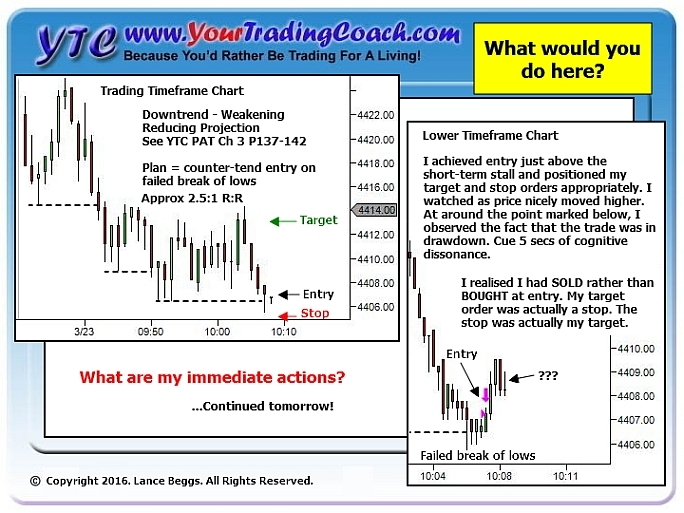 Look to the lower timeframe chart to see if it's possible to work a better exit. Position the stop and target at levels appropriate to the lower timeframe structure. 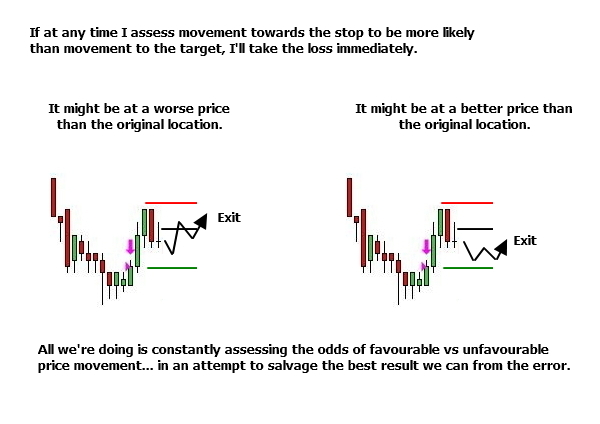 Assess odds for movement to both the stop and target. 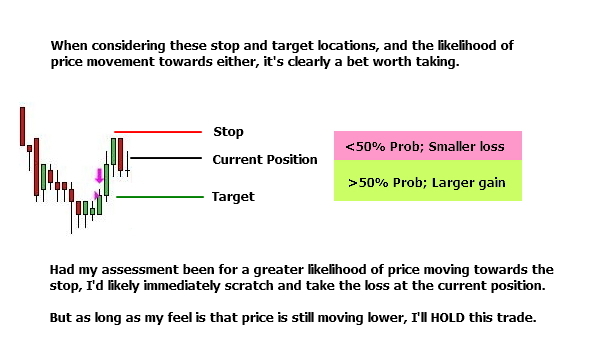 At any time while you assess the odds and potential payout favouring movement to the target, hold the position. 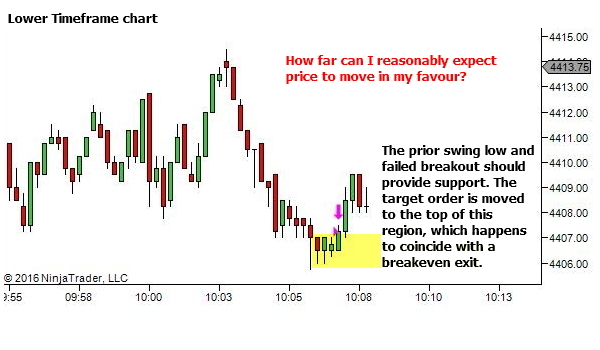 At any time while you assess the odds and potential payout favouring movement to the stop, exit the position. 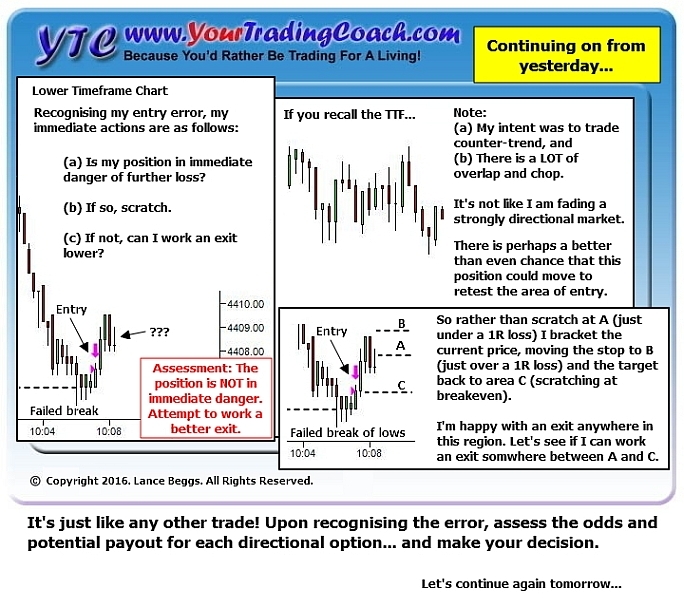 Just like the decision to enter any trade… managing an error is just a matter of assessment of the odds and potential payout. Errors happen from time to time. Master Lance, can’t believe you just had this blog post! Great post as always. I just suffered one of my worst trading days on Friday due to an entry error. Ahhh yes… we’ve all done that! An unexpected 20 pip loss is not nice. But assuming it’s only maybe a 3R or so loss it’s not the end of the world (I’m making an assumption here about your 1R size so could be wrong). In any case, all you can do is review your entry and trade management procedures to see if there is something to learn from it. Remember the old saying, there are no losses, only profits or lessons. Either way we gain something. And stay away from the markets until the anger and frustration have gone. (a) It looks like you’re using STOP LIMIT orders, rather than STOP MARKET orders for your stop losses. Is that right? If so, just be aware that a stop limit may not fill. Price can move through them to worse levels, without filling. Stop market should always fill, but may incur slippage. It depends upon which you are willing to accept. Personally, I only use a stop market order. If I’m wrong I want to be out of the market. 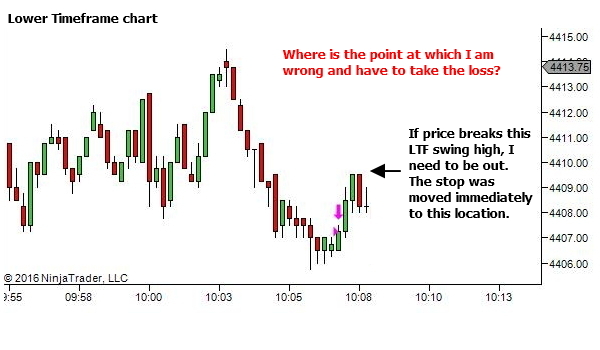 (b) Am I right that it appears you’re just manually placing stop and target orders, rather than using the ATM Strategies to automatically place them? If so, you really should look at the Ninja training on ATM strategies. It will automate the process of initial placement. And when one is triggered, it will automatically remove the other for you. Also, can I ask what is the DOM that you’re displaying to the right, with the blue/red background and the volume-at-price display? Sorry for the late reply Master Lance. It slipped my mind and I got a bit busy. I don’t really use R multiples…still keeping things very basic and simple to tick value stops as I am still working on getting my expectancy above 0! a) Yes you are right. Noted! I will start using stop market orders from now on. b) Yes, its all manual as I don’t want extra costs on my tiny trading business that is not generating any revenues i.e. still making losses! Plan is to become a bit profitable and then re-invest by buying Ninjatrader outright. Its a really good free resource. I am, however, yet to be able to use it profitably….